Here’s a story of a Christian conversion. Can you guess who’s talking? So one Sunday, I put on one of the few clean jackets I had, and went over to [a church]. And I heard [a pastor] deliver a sermon … And during the course of that sermon, he introduced me to someone named Jesus Christ. I learned that my sins could be redeemed. I learned that those things I was too weak to accomplish myself, He would accomplish with me if I placed my trust in Him. And in time, I came to see faith as more than just a comfort to the weary or a hedge against death, but rather as an active, palpable agent in the world and in my own life. Legendary cellist and humanitarian Pablo Casals was interviewed by George Carlin. Carlin asked him why, at age 93, he still practiced three hours a day. I think I’d better get to work. 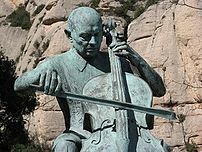 Pau Casals i Defilló (December 29, 1876 – October 22, 1973), best known during his professional career as Pablo Casals, was a Spanish Catalan cellist and later conductor. He made many recordings throughout his career, of solo, chamber, and orchestral music, also as conductor, but Casals is perhaps best remembered for the recording of the Bach: Cello Suites he made from 1936 to 1939. An ardent supporter of the Spanish Republican government, after its defeat in 1939, Casals vowed not to return to Spain until democracy had been restored, although he did not live to see the end of the Franco dictatorial regime. So fierce was his opposition to the Francisco Franco dictatorial regime in Spain that he refused to appear in countries that recognized the authoritarian Spanish government. He made a notable exception when he took part in a concert of chamber music in the White House on November 13, 1961, at the invitation of President John F Kennedy, whom he admired. On December 6 1963, Casals was awarded the Presidential Medal of Freedom. 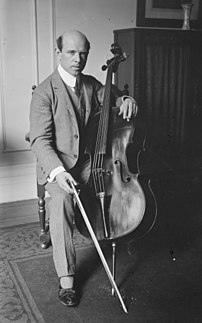 Casals died in 1973 in San Juan, Puerto Rico, at the age of 96. In 1979 his remains were laid to rest in his hometown of El Vendrell, Catalonia. He did not live to see the end of the Franco dictatorial regime, but he was posthumously honoured by the Spanish government under King Juan Carlos I, which issued in 1976 a commemorative postage stamp in honour of the centenary of his birth.